On the second Sunday of Lent, we move from Jesus' retreat to the desert and temptation by the devil to the glory shown in Jesus' Transfiguration. Today’s scene closely resembles God’s revelation to Moses, who also brought along three companions and whose face also shone brilliantly. These directions were given to Moses on the top of Mount Sinai. Moses came into contact with God and he was changed. Not only in appearance, but deep down in the core of his being. He had come close to the Holy One. He had seen God and he had been changed—forever. It should be noted that Moses was not only changed in a personal or private way by his encounter with God, but it was such a life-altering event that it also changed the ways that he interacted and communicated with others. So, this life-changing experience was not an isolated, personal, religious experience, but a very public thing that changed the life of Moses. They couldn’t un-see what they had witnessed—reality peeled back to give a glimpse of the Kingdom of God. They were changed. When they descended the mountain, they kept silent and told no one of what they had seen and experienced. 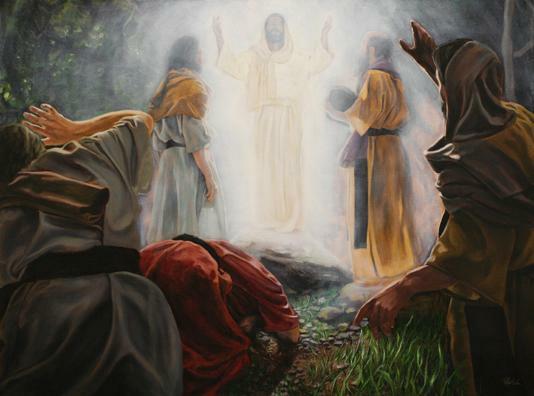 Like Moses who saw God on the mountaintop or the people who witnessed the inbreaking of the Kingdom of God through the life of Christ on earth, like the disciples who couldn’t quite recognize the true identity of Jesus until he was transfigured before their eyes, we too are forever changed when we see and encounter God. Today, on this Day of Resurrection, we encounter God again. We encounter God in gathered community, in Word proclaimed, in Bread broken and in Wine poured. And so we are changed once more. That change which began when we were first conceived by God continues today as we are changed from one degree of glory to the next and our faces shine with the splendour and glory of God. None can come to Christ…and go away as they came….Our coming to Christ changes everything.